At the 44th Annual Country Music Awards, country stars Carrie Underwood and Brad Paisley hosted the event in Nashville, Tennessee. The former American Idol winner went through many wardrobe changes throughout the night. Wearing a lot of silver, Underwood first arrived to the awards show in a tiered Talbot Runhof gown and a Swarovski blush crystal “Power” clutch in hand (center). On stage, she wore an Ina Soltani silver sequin mini dress with a black dramatic ruffled strap and Bochic earrings (left) and later performed in a WTB outfit and accessorized with Bochic earrings. Underwood presented an award in a Randi Rahm blush lace and organza strapless cocktail dress with pleated swirls and hand rolled roses finished with Swarovski crystal centers and later performed in a one shoulder dramatic ball gown also designed by Rahm. The starlet brightens up the mood by going for color, first in a sunset/ivory watercolor print pleated dress by Pamella Roland and then in a short tiered gown. Both dresses were accessorized with Bochic earrings. Katherine Heigl supported her husband singer Josh Kelley in a strapless body hugging Farah Angsana dress. Kimberly Williams-Paisley also supported her husband and co-host Brad Paisley in a satin one-shoulder David Meister gown. Sheryl Crow in a Zac Posen “Alice” print starburst gown. Leighton Meester in an Emilio Pucci halter dress with train. Taylor Swift in a strapless red Monique L’huillier dress, Jimmy Choo shoes, and Neil Lane jewelry. Country Song star Gwyneth Paltrow shows some leg in an Atelier Versace dress and Christian Louboutin shoes. Julianne Hough goes dark in a Georges Chakra Couture tiered organza gown with crystal embroidery and a statement ring and stacked bracelets by Daniel Swarovski. Meghan Linsey poses in a sapphire blue tiered gown by Gustavo Cadile and Swarovski‘s navy satin “Libertine” clutch. Laura Bell Bundy models a strapless Jean Fares Couture gown that is tied together with a belt. Kellie Pickler in a Pamella Roland gold paillette plunging v-neck cap sleeve evening gown and gold crystal and white enamel “Laser” earrings by Swarovski. 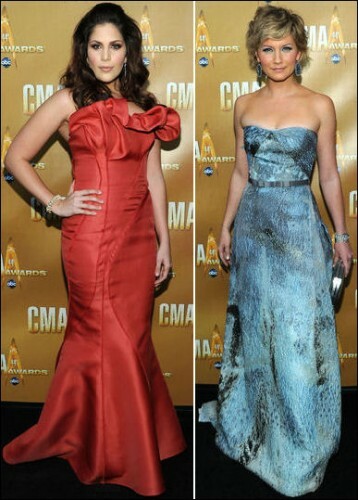 Hillary Scott of Lady Antebellum wears a body hugging strapless gown by J. Mendel. Jennifer Nettles of Sugarland in a strapless Carolina Herrera dress. Laura Bell n Julianne looks the most glamorous, next is Carrie, then Katherine. OMG..Cheryl n Leighton worst dress, ugh! !